Peterborough rider Ulrich Ostergaard made the podium at an individual meeting last night (March 31). The Panthers captain was second in the Julie Lewis Memorial meeting at Redcar. 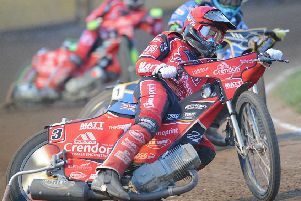 Ostergaard, a former Bears rider, racked up 12 points from five outings at the Media Prima Arena – a tally bettered only by new Redcar number one Jason Garrity, who took victory with a 15-point maximum. Ostergaard is in action again tonight when he lines up in the Harrisons Scottish Open in Edinburgh.